First Line: The minute Nova Negrahnu heard about Solarversia she was convinced she was going to love it with every ounce of her being. 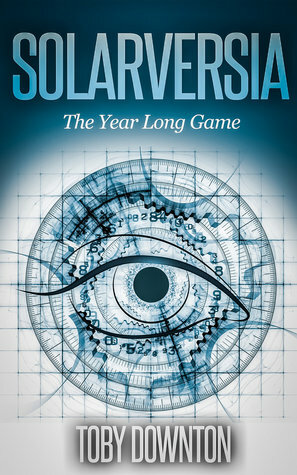 Synopsis: Solarversia is a year long game that happens every four years. Nova is determined to play and win, along with her friends Burner and Sushi. What was supposed to be a year of epic game play, turned into a year of epic change. Because of a terrorist organization, the Holy Order, Nova’s life becomes something she never expected. Review: When I first started reading this I had high hopes. I was told it would be similar to Ready Player One. That is actually how the author of the novel found me, through a post on twitter about Ready Player One. Of course, I was ready to read another book similar, but I quickly found out that the only things the two books had in common where that they were about a game. The first half of the book was a little slow, to be honest. I drug myself through it, trying to find interest. It wasn’t completely boring, it just didn’t capture my attention. But I kept reading because I was slightly intrigued by the concept. At the half way point I was glad I had kept reading. It started to get a little intense and I was hooked. I needed to know what happened next and I needed to know right then. I was right there with Nova as her world came crashing down around her. I was in her crowd of fans, cheering her on. The emotions this book put me through was something I hadn’t expected. The ups and downs, the happy and the sad. I wanted everything to be okay, but at one point you realize, nothing will ever be okay, at least not right now. Conclusion: This books is a pretty massive book. But it was worth every hour I spent reading it. The suspense, action, tears and laughter. It was all worth the time it took to read this book. The ending seems to have left the book open for this to continue on in a sequel, yet it gave a perfect ending to answer questions and not leave you hanging. I would recommend this book to anyone that loves stories of games. I may not have been sold on the first half of the book, though it was important to include, but the second half had my head spinning and I loved it! Eww text books! LOL I only work and I don’t get out a lot. That leaves a good chunk of time to read and write. I have seen people read even more than I do and it’s crazy. I’m actually considered a slow reader. Thanks for taking a chance on an unknown author Heather, I’m glad to hear you think it picked up after the halfway mark!